This was what Scrooge said, after the three spirits had visited him in Charles Dickens’ “A Christmas Carol”. 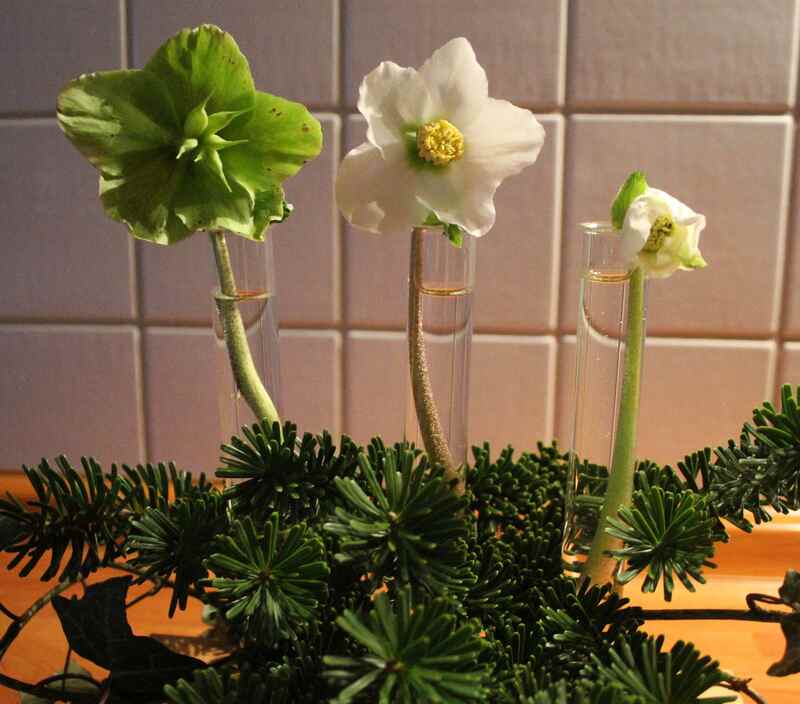 These three Hellebores (Christrose in German) demonstrate the three stages of life that the spirits made Scrooge visit on his eventful Christmas Eve… the Past, the Present and the Future. Thanks go to Cathy at Rambling in the Garden once again for the opportunity to show some materials from my garden in a vase on Monday. And this week I have a new “vase” too! The ivy and silver fir around the base are added for the seasonal touch. I like to look at some Dickens every Christmas. It became a habit while I was still teaching, since a production of “A Christmas Carol” is shown in English in our town theatre every year and I have often been with students. My own English teacher at school also managed to convince me of the positive side of Dickens, and I admire his ability to entertain with words/wordiness and social comment. ‘Happy, happy Christmas, that can win us back to the delusions of our childhood days’. Have a wonderful week, stress-free with time for some fireside or candleside relaxation and contemplation! This entry was posted in Garden, In a Vase on Monday, Traditions, Words and tagged Christmas, Cut Flowers, Garden, Quotes, Winter. Bookmark the permalink. Lovely to see your Hellebores; I love the new vase, I would like something like that too. Don’t you find that when you’re shopping for Christmas presents you find more things that you’d love to be given than you think will be right for someone else? Or is that just me? I too love a little Dickens at Christmas. I enjoy several different versions of the Scrooge story in movies. My favorites coming from the 1930s. So you can image my delight when I saw your arrangement…Perfect for the season Cathy! I am determined to plant a few Christmas roses in a special spot next year. They would have bloomed early this year with our weather if I had planted them this year. Mine started flowering in October this year Donna! I also have a beautiful red one that won’t flower until spring. I usually buy a new one for a winter pot each year, and plant it out afterwards. The white ones (without names!) seem to do best. that green hellebore is so pretty and I am sure you will get much use from those stylish tubes. I came to Dickens quite late, (even though I am an English graduate!) but agree that he is quite appropriate at this time of the year. Hi Ann. Yes, I also like to see various TV versions of A Christmas Carol…. somehow Dickens managed to highlight both the best and the worst of the season. There have been some wonderful Scrooges over the years! If you do go this year, have fun Marian! What a boost you have given my day with your delightful bouquet and Dickens reference. And I can hardly think of any flower in my garden that is so notable in each stage of its life as the Hellebores. Happy Christmas to you. Thank you Linda. Glad you enjoyed the quotes and the flowers! Enjoy the last week of Advent! Not only do I like your Christmas vase but the quotes are so true. Hi Karen. Yes, Dickens was a wise man and able to express truths extremely well. And a very Merry Christmas to you too. A lovely arrangement and pure sentiments. Thanks for sharing. Great idea for a Monday vase, and, yes, we all love Dickens! A nicely linked arrangement and words Cathy. I think my favorite version of Christmas Carol was the one by the Muppets!! Thanks Brian. Yes, the Muppets version is probably my favourite too…. have watched it many times, also with students! Michael Cane made a good Scrooge. What a lovely ode to the spirit of the holiday! It’s so easy to get caught up in the frenzy of the season. We had a windy, rainy storm this weekend and now I’m planning to scout the yard for good things to fill a vase for the week. 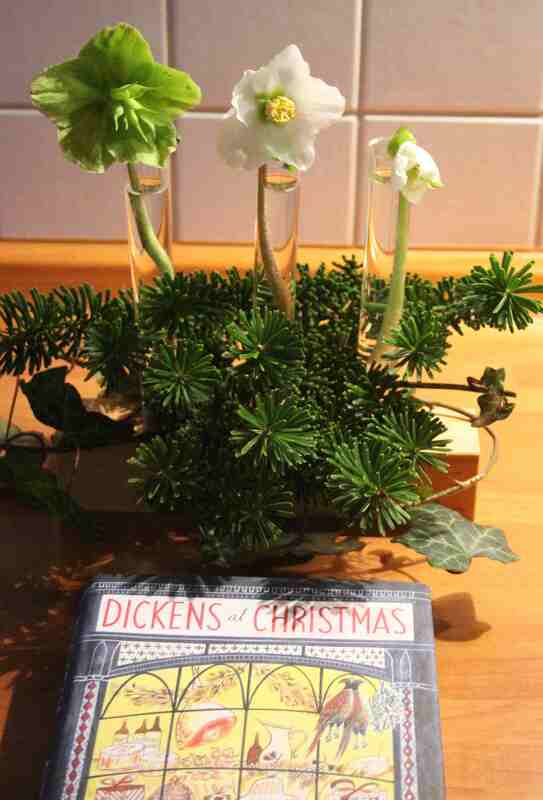 This is a delightful floral tribute to Dickens’ Christmas Carol, Cathy! I planted some hellebores here last year and I’m anxiously waiting to see if they flower this winter. Southern California doesn’t provide the most hospitable environment for these plants. I do hope they flower for you, as I would never imagine them in such a warm climate…. there is usually snow on the ground when they start flowering here. What a brilliant idea, Cathy. It’s perfect for the season! Lovely combination of hellebores and dickens. 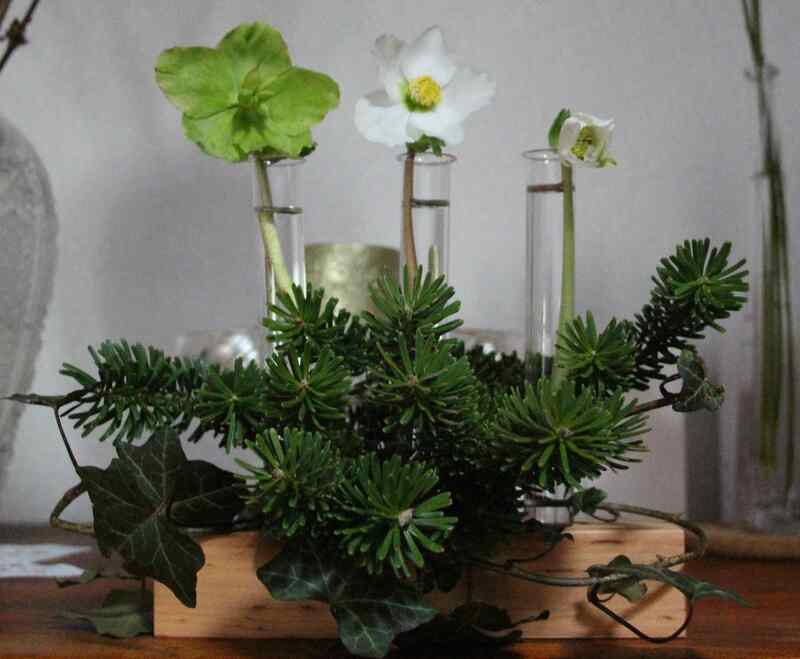 Test tubes are great for those shy flowers. Your floral interpretation of that quote is just perfect Cathy. ‘A Christmas Carol’ is one of those books I have reread several times now over the years and if there’s a film version on television over Christmas I will be glued to the screen! The same here, Anna. Love to watch it again and again, and certain passages get reread every year. I especially love the page-long description of all the food piled up around the ghost of Christmas Present when he first appears! I love Dickens and hellebores, so this post is perfect Cathy. The quotes are lovely, too, especially the last one. That man knew a thing or two about the human condition. Have a great week. He certainly did, Sam. That’s what I admire about him most, as he used his skill with words to draw other people’s attention to important issues. AND he was entertaining! Love Dickens,and your Hellebore arrangement! Thanks Jason! The Hellebores have flowered very early this year. I love Dickens, too, Cathy. i just received a gift from a friend, a beautifully illustrated version of “A Christmas Carol,” signed by Charles Dickens’ great-great grandson, Gerald Charles Dickens. My friend had attended a recitation and performance by GCD, and thought of me. I would love to find another performance some time. I had no idea one of Dickens’ heirs was performing in America. Kind of unique, don’t you think? 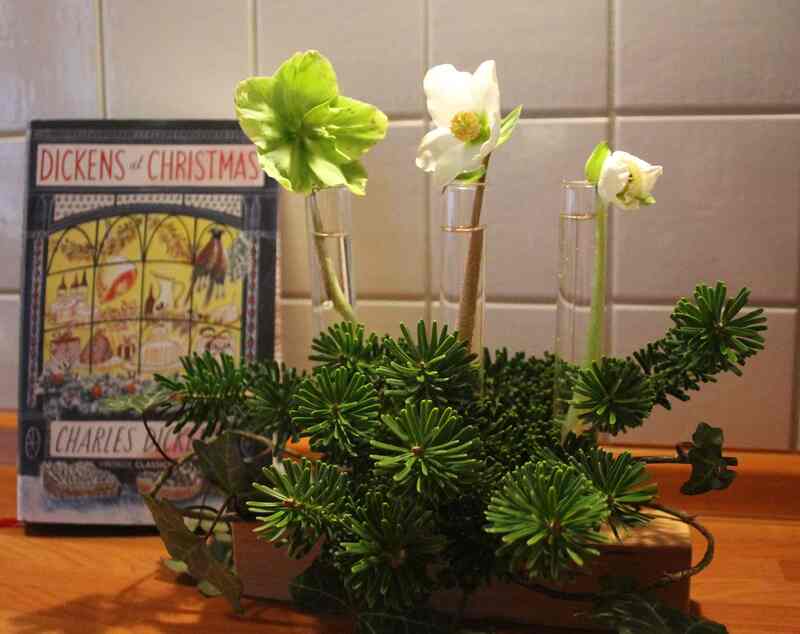 🙂 The three Hellebores are quite majestic, and I think the German “Christrose” is perfect for Christmas. I really enjoyed the quotes, Cathy. Wishing you a wonderful Christmas and holiday season, my friend. What a beautiful gift! I also had no idea any of Dickens’ ancestors were touring the US. That sounds so interesting, I must find out more. Thank you Debra! Thanks Bec. Mine are never usually this early, so it’s a bit odd! I always buy a flowering one for my patio and the green flower is from that. Beautiful post Cathy–just perfect for the season. I love your new test-tube vase–seems very versatile. Your hellebores are lovely. Cathy I love all those Dickens quotes and I love your new vase. It looks seasonal and festive but I can see it in use all year long, too. I love your interpretation with the hellebores Cathy!! I have been rereading A Christmas Carol this month so can identify with your flowers – I cannot believe how many ‘past’ hellebores I already have – this warm weather is bringing them out much earlier than usual. Thank you Julie. Yes, my hellebores are really early too, but I must admit that the green one is from a new plant I bought for the patio. I don’t usually see many flowers until spring! We have that edition of the Dickens stories, too–so charming! Beautiful plants–thx for sharing!–and a wonderful Christmas to you & yours!!! Thanks Steve. Yes, I have been thumbing through my small paperback version of a Christmas Carol and this was one of the passages I highlighted; when I was teaching I often used bits of the story for all sorts of activities and discussions for Christmas lessons! In the lead-up to Christmas, American television channels have been showing various movie versions of A Christmas Carol. In all of the versions I’ve ever seen, there’s never a voice-over giving any of Dickens’s narration, like that first sentence you quoted. I heard about the Muppets version this morning but I’ve never seen even a part of it. Oh, you must remedy that this year Steve!